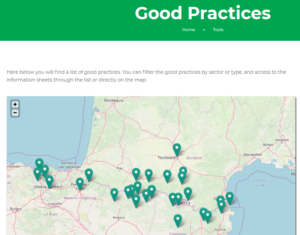 The Pyrenees Climate Change Observatory (OPCC) created a new online database of good practices regarding climate change adaptation in the Pyrenees. The OPCC aims at monitoring and understanding climate change in the Pyrenees. The new database provides a wide range of good practices on climate change adaptation and aims at inspiring other mountain areas’ stakeholders in preserving their territories. The available good practices concern various thematic categories from agropastoralism and fauna and flora to energy and forest management. In order to facilitate the access to targeted good practices, users can filter them by category. It is also possible to select a type of climate impact, such as “water scarcity”, “extreme temperatures” or “cryosphere degradation”. Thanks to a map, users can also directly spot the closest initiatives to their home. Whether you are looking for inspiration for your sector, near you or to answer a specific climate related issue, this new database can provide you with answers and examples! Mountain areas have an important potential in mitigating climate change but are also currently suffering from its consequences, as showed in the last OPCC report “Climate change in the Pyrenees: impacts, vulnerabilities and adaptation”. This new database is therefore a new useful tool for mountain areas local authorities and stakeholders willing to answer a specific climate related issue. Most good practices available in the database were collected from the LIFE EU programme projects, regional initiatives or municipal action plans. They are available in English, French and Spanish. Sustainable tourism policy: what is at stake after 2020?